My Great Aunt Abe loves to play Uno and evidently she loves to bake as well. Recently I went through some of my Aunt Abe’s things that were gathered from her home as she is now moving to assisted living. In the box of miscellaneous items I chose a set of hand stitched pillowcases that belonged to my Great Grandmother, a little cleaver (I have no idea what she was doing with a mini cleaver but I plan on using it for cheese platters as it will be easily able to hack through hard cheeses), and a book filled with her hand written recipes. Hand written recipes are so precious to me. 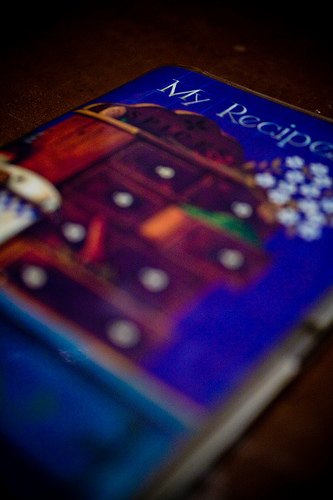 Someones personal collection of favorite recipes is more intimate than a journal and more revealing than dirty laundry. I long to find the cook’s notes in beautifully written script on the edge of a yellowed page in a used cookbook. I just really love old recipes. Today we are bombarded by the precision required in baking. I can not dispute the fact that baking is a science but recipes given to me by those in my grandparent’s generation focus on the art and feel of it rather than the technicality required. In the few but precious moments of baking instruction given to me by my grandmother she did not recite a recipe accurate down to the 1/8 teaspoon. Rather she taught me what to look for and what it should feel like. Similarly as I skim through this newly acquired treasury of retro recipes, the notes on the method are simple and brief. There are no sweat inducing introductions to the recipe that demand that every ingredient be 97.2 degrees. They are simple, delicious and memory-evoking dishes. When I saw, “Crunchy Chocolate Cookies” in her collection I just knew I had to try them. With corn flakes as an ingredient I was intrigued. And with two sticks of butter and one cup of vegetable oil I knew they couldn’t be that bad. It turns out my intuition was correct. These cookies are truly delicious. One bite and I was flooded with memories of snagging these cookies off the potluck table in the basement of my Grandmother’s church. They are as the recipe suggests, “crunchy”. But it is not the kind of crunchiness you taste from and over baked cookie. It is the addition of the oil that gives it a tender crispness that shatters in your mouth. 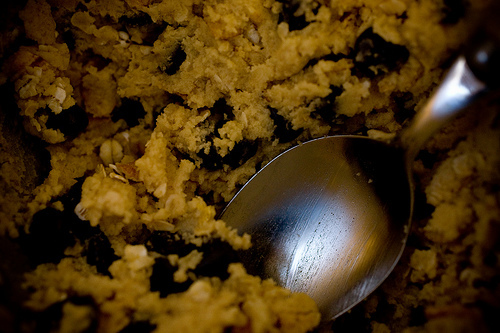 The oats in the recipe give the cookie some bulk and chew, which I find very enjoyable. Although the cornflakes are not very easy to detect in the finished product, every once and a while you get a slightly salt crunch that reminds of you scarfing down a bowl of the flakes in the morning before jetting off to first period. Don’t be to scared of the amount of fat in the recipe. This batch makes a very large quantity. However it is still early in the evening and I have already eaten six. I hope you enjoy them as much as my Aunt Abe and I do. Bake at 350* for 12 min. Sift the flour, salt and soda onto wax paper. Beat butter and sugars until well creamed. Combine egg, vanilla, milk and oil in a small bowl. 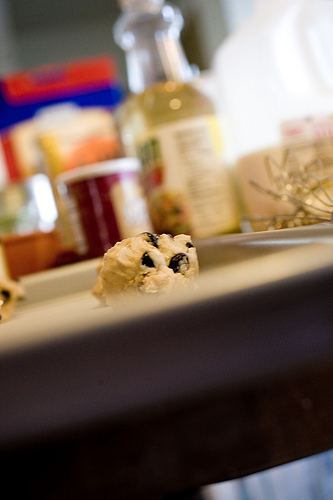 Alternately add the oil mixture and the flour mixture to the creamed sugars. Mix until just combined. Stir in the corn flakes, oats and chocolate. Drop by heaping teaspoons onto cookie sheets, 2 inches apart. Bake until golden. I just made these…YUMMY! I have never baked a cookie with oil in it before. I really like the touch of crispiness! These are going to be gone quickly at our house. Thanks for sharing. I’m so glad you tried them and ever more glad that you enjoyed them so much. We are nearing the end of our batch. Yikes. 4 dozen cookies devoured in two days. Aunt Abe always kept them in a tin in the fridge. 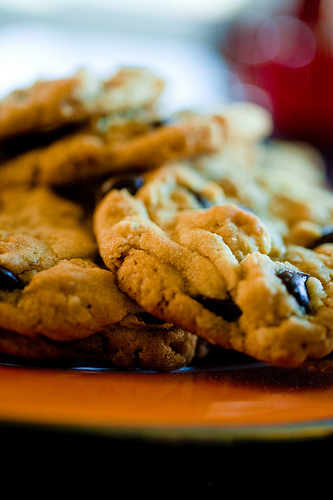 For some reason they taste better cold… This is probably my all time favorite chocolate chip cookie recipe! Brianne – You are so right! Now I have to make another batch just so I can eat them cold. Although I had never heard of corn flakes in a cookie before one bite and they tasted so familiar. 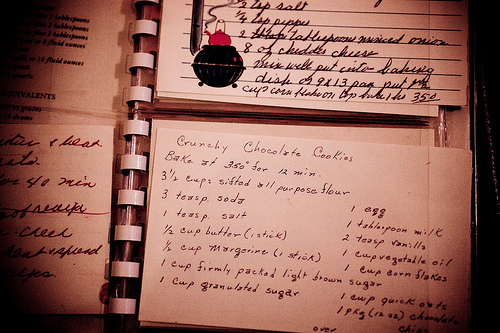 I enjoyed a trip down memory lane thinking about my grandmother’s handwritten recipe book, too. I made mention of your lovely post in my most recent post, as well as another cornflake treat you might enjoy! I just made these for a family road trip tomorrow. Of course, I had to sample one of them – so yummy! Thanks for sharing. Freezer would be good too. The Co-op and Terra Organica in Bellingham carry Turbinado sugar. I am sure you can order in online too. I link to it in my Amazon store. But really they are great with out it too. 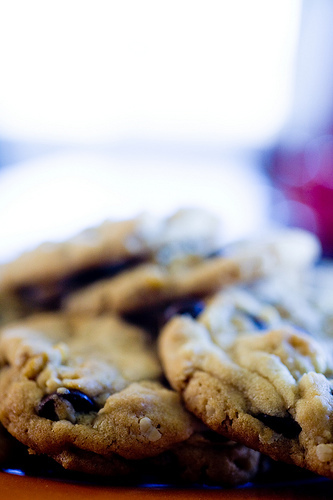 The addition of that sugar just gives the cookie a bit more dimension and a little sugary crunch. You can use any salt really. I like the size of the flakes of the ones I mentioned. The salt just adds some more dimension to the cookies. You can omit that if you like as well. Or just sprinkle a tiny amount of regular salt just before going into the oven. i love those little hands. I like finding old hand-written recipes. This sounds really intriguing to me. Cornflakes, huh? I’ll have to give it a try. One of my great aunts was the baker in the family. Her recipes consisted of a list of ingredients (with amounts). That’s it. No directions at all. Takes some practice before the results are the same! Ash, I missed this post before but so glad you sent it to me. Now that dear sweet Aunt Abe is gone, her handwriting on the recipe brought back sweet memories. She did indeed bake and some her treats, like grandma’s, simply can’t be replaced. Although I must say she wasn’t much of a cook. Having lived with her for a year while going to SPU, I recall mostly fried drumsticks and pancakes. That was about as far as her culinary skills went. But what she did miss in gourmet cooking she more than made up for with her humor, all-inclusive friendships, her love of just being together, playing games and laughing, laughing, laughing. Oh, this recipe looks divine! I have to try it. Thanks a lot! Curious if olive oil could be substituted for the vegetable oil? @Julie – Yes, if it is a mild flavored olive oil. Oh my. I just made these with my boyfriend’s 7 year old and he and I are pretty sure we will stab anyone who comes near them. 🙂 These are amazing. Thank you for sharing this! I’m making these right now — the dough tastes amazing! I don’t see where the milk comes in dough. Do I add it with the other liquid ingredients? whoops! I meant where the milk comes in, though. Amy – Thanks for noticing that! I just changed the recipe. It should go in with the rest of the wet ingredients. Did anyone have trouble with the cookies not “rising” Mine are pretty flat. I’m sure I put the right amount of baking soda. Oh well they still taste good. I must have done something wrong. My cookies were incredibly dry. Not even the kids would eat them. What went wrong? I followed the recipe exactly. These cookies are great! My grandma used to make them. I always hated the thought of all the butter and oil in them – and I still do, I guess – but there’s nothing like eating something that reminds me of the good old days when grandma was still around. These look delish. I’ll have to try them! in which I’d like to ask if you do not mind. I was curious to find out how you center yourself and clear your thoughts before writing. I have had difficulty clearing my mind in getting my thoughts out. I do enjoy writing but it just seems like the first 10 to 15 minutes are usually wasted just trying to figure out how to begin. Any recommendations or tips? Thanks! I just made these and feel the need to write ‘DANGEROUS” across the recipe, they’re that good! So glad I finally got around to making this recipe, it’s now become a favorite. I have one question, rather than polish off the entire batch single-handedly can I freeze half the dough for later? Unfortunately, my husband isn’t a big sweet eater. Thanks so much! You can totally freeze the dough. I’d freeze it in logs so you can easily slice and bake or in pre-portioned balls. Ohhhh I love to hear that. These cookies have so many fond memories attached for me. I’m so happy the love can be spread through them. the best cookies i’ve ever cooked. the technique is to eat it after it was stored inside the fridge. the cornflakes will be crispy. the best cookies i’ve ever cooked. the technique is to eat it after it was stored inside the fridge. the cornflakes will be crispy. oh it’s also nice to place filling like a nutella before baking it. Marvellous cookies! 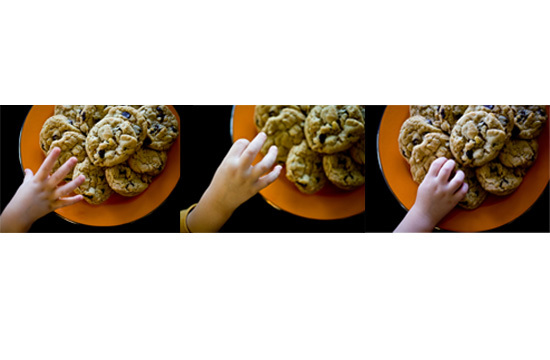 I had a recipe for cornflake & chocolate-chip cookies but they always turned out too hard no matter what. Now THESE are absolutely wonderful! The texture is spot-on and my husband, who before he met me hated cakes and cookies, loved these and has asked me to make them again. Additionally, as an ex-pat Kiwi, I am not used to food with high fructose corn syrup and avoid it like the proverbial plague. So baking from scratch is hugely important to me – this recipe certainly fits that bill! I owe you a HUGE thank you, Fiona. I hadn’t thought of this recipe in so long. I made it yesterday and was reminded of how much I love them. Just made the cookies, I have never made cookies with corn flakes. But, they are really good. I think next time I will crush the corn flakes. Thanks for sharing.